Endearing. Endearing is the word to describe what quality and feeling writer/director Geremy Jasper captures in his feature directorial debut after spending the past seven or so years in the world of narrative shorts and music videos (Selena Gomez and Florence + the Machine among his subjects). Unsurprising then is the fact that Jasper's first feature-length effort, that he's also the sole writer on, deals heavily with the worlds of music, ambition, and the stark difference in those that live to make music and those who make music for a living. This has always been something of a fascinating area for artists to find themselves in-this kind of gorge where either side seems a steep slope that could easily threaten their ultimate goals in one way or another. On the one hand, there's fame and all that comes with it including both the many positives and the mountain of sacrifices while on the other hand it's hard to imagine trying to make a living doing something else while having your true passion be relegated to little more than a hobby. 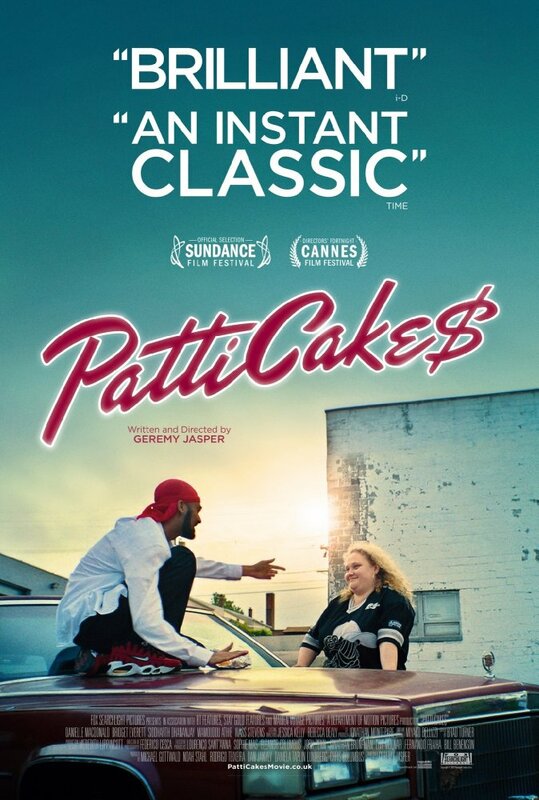 If you've ever chased a dream involving music then Patti Cake$ is wholly identifiable no matter the genre specialized in, but even if you have not a single, musically-inclined bone in your body the film still stands as a testament to anyone who has ever had odds stacked against them. I won't get too hyperbolic here given that, at the end of the day, this is a movie that does well to accomplish what it sets out to, but never comes across as something truly transcendent in what topics it's touching on or exceptional in how it conveys or delivers those ideas. 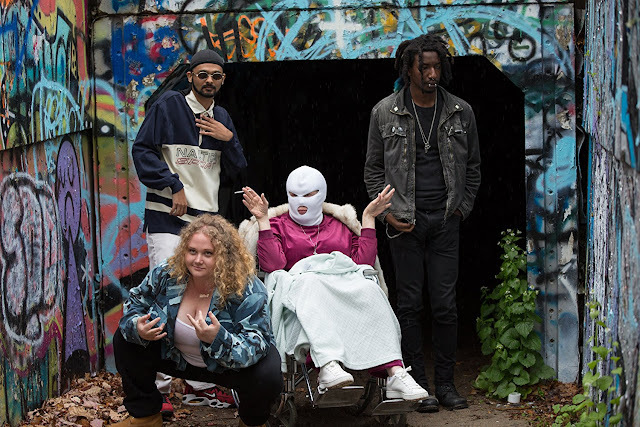 Patti Cake$ has enough going on in its brain though, and is brought to life through such humbling albeit misguided shells that they do indeed come to be endearing thanks largely in part to the captivating performances from each of the members of this eclectic cast. Through the course of events in which we follow these engaging characters Jasper also begins to explore not only the inner turmoil of the titular Patti (a revelatory Danielle Macdonald), but he also takes on the culture that has bred her, that has groomed her into this personality that, strangely enough, defies the conventions of what a young, poor female would take from societal cues. Jasper addresses this blending of cultures and where the line is drawn or if there is a line at all. Patti Cake$, while charmingly performed, is most notable for digging into these ideas of our present, Instagram-obsessed society that is ironically full of people who don't seem to know themselves at all. 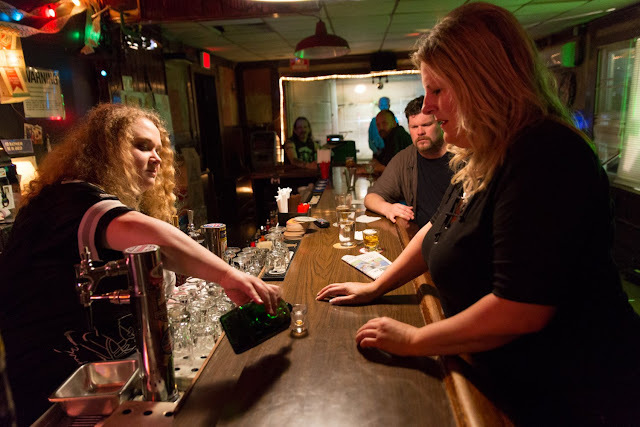 Patti (Danielle Macdonald) pours her mother, Barb (Bridget Everett) a shot because, "blood is thicker than jäger." Macdonald is Patricia Dombrowski, a.k.a. Killa P, a.k.a. Patti Cake$, who is an overweight bartender at a local place in Jersey called Lou's where the same dozen people hang out every night and where her mother, the equally robust Barb (a poignantly heartbreaking Bridget Everett), sings karaoke every night and drowns away her sorrows in free shots. Patti, who is obviously older than twenty-one but seemingly only by a little still lives at home with her mother who can't seem to keep a steady job and therefore unreliable sources of income and largely seems to still be tethered to her childhood home for the sake of her ailing Nana (Cathy Moriarty). Nana is sick, but still smokes, drinks, and watches daytime TV to pass the no doubt painful experience she is living. Patti keeps getting calls from debt collectors threatening legal action if she or someone doesn't start making payments on Nana's hospital bills. Nana also requires medicine and other kinds of care that require spending a lot of money as clearly Barb doesn't have any insurance and I'm pretty positive Lou isn't offering any benefits for his employees either. Still, Patti never sees Nana as a burden-she is more of a partner in crime who at least shows interest and allows Patti to try out new rhymes on her each time she comes up with one. This leads to Patti's main source of relief which is her music. She may not be able to sing like her mother (who is maybe the biggest burden in Patti's life), but she has a passion for lyrical configurations and, more importantly, a penchant for putting such configurations together in an effective manner. Down at the pharmacy where she fills her Nana's prescriptions she's made friends with Hareesh (Siddharth Dhananjay) who fancies himself a Nate Dogg sort to Patti's Foxy Brown. While Patti has the talent it is Hareesh who has the ambition and the ideas to that sets the two of them, along with Nana and a local metalhead/objector of all things mainstream (Mamoudou Athie) to join forces and go on this bonkers quest to find glory in the rap game and get out of their downtrodden reality in New Jersey. Watching Patti Cake$ the first thing that hits you is the all-encompassing role that music plays in Patti's life. From the moment she wakes up music is either playing or she's thinking of rhymes by the time she's brushing her teeth. There are a million reasons this young lady shouldn't be able to conjure up the energy she has to delve into the psychology her bars dissect, but in dissecting comes understanding and in painting a bigger picture once gets clarity and that is no doubt what this type of self-reflective art does for Patti-it offers clarity in the form of an escape. The moment Patti steps outside for the first time in the film to head to work we're led to believe she's hot-wiring her car, but rather she is simply digging around in that car for a Walkman that is so outdated it's a wonder her current favorite artist has discs that will play on it. Patti pops in the album, put on her headphones, and begins the trek to work-the music elevating her to a place where her life seems more bearable. Jasper conveys this through symbolism typical of offbeat indies where we see Patti begin to float into the sky as if walking on air as she lets the music in her headphones take over her entire being. It isn't until a car horn comes screeching up behind her that she's brought back down to earth and immediately reminded what the whole of society thinks of her. This brings into glimpse the first peculiarity about Patti that we notice; despite Patti being a bigger girl, despite the fact she is white, and despite the fact she is poor Macdonald never conveys a sense of insecurity about who Patti is and who she wants to be. In other words, Patti initially sees no reason as to why the cards would be stacked against her despite what pop culture spews on the cover of magazines and photoshops to unattainable standards. It isn't until she meets a hero who criticizes her of being a "culture vulture" that there is any semblance of self-doubt. It's such a small, but key choice in how Jasper wrote the character and how Macdonald ultimately plays Patti that you almost miss it while watching the film. It is something we simply assume is inherent in the character from the beginning and so we go with it which speaks to mine and our own insecurities with the point being that Patti is true in her intent, honorable even, and above all else genuine in how she utilizes what was born out of black culture. By the end of the film this means everything though, and the tracking of this arc by Jasper and his screenplay along with the bringing of it to tangible life by Macdonald is by far the strongest aspect of this rather ambitious piece. PBNJ consists of (from left): Hareesh (Siddharth Dhananjay), Killa P, Nana (Cathy Moriarty), and Unknown (Mamoudou Athie). What's interesting is how Patti's environment both contributes to who she has become while simultaneously fueling her talent. She has this skill for crafting lethal poetry, but the content of that poetry is largely centered around her everyday life. Whether that be a crush she has on the local weed dealer, Danny (McCaul Lombardi), who also happens to be the local celebrity that gets by more on looks and street cred than actual talent, the struggles of her home life with her mother, or simply the struggle of trying to break out of Jersey to the other side of the river; the nurture is what feeds the substance of what she's spitting and what allows Patti to consistently cultivate what seems like the only way to escape the inevitable fact life will cycle through just as her Nana and her mother's lives have before. For Patti, there are seemingly no color lines-Danny is as white as snow, but his rap game has the respect of most of the community-there is just the reality of the situation. And so, when Patti comes face to face with someone who doesn't know the context of her situation or of how much music means to her and has made up the significance of her life she doesn't understand how one could think she was doing little more than ripping off black culture when what she knows is literally all she knows. It's difficult to get into the weeds of examining those who aren't, but are still fascinated with black culture without potentially becoming offensive especially when coming from a movie that was written and directed by a white guy, but the fact of the matter is that there are those who genuinely love hip-hop and the flavors it offers who are not black. It seems Jasper is one of those people as he has said many times that Patti Cake$ came from little more than his desire to actually write rap music and thus the reason it has been positioned to come from an even more unlikely source such as Patricia. Jasper seems to want to emphasize the fact that anyone, literally anyone, can love rap or any other genre of music not because they understand or are a part of the culture in which it was born or from which it came, but simply because it makes them feel something when it plays through their speakers. 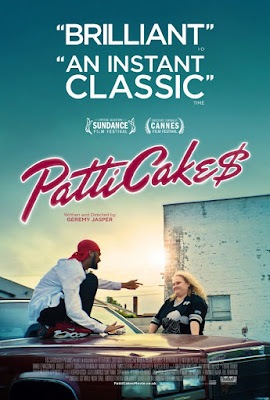 Furthermore, if Patti Cake$ proves nothing else it's that in this world of fake celebrities and fake news, Patti gets down to the grit of who she really is through her music and is therefore probably too good and too real for whatever criticisms widespread fame would bring. Overall, Patti Cake$ is a movie that screams at the top of its lungs that if you believe in something that you should believe in yourself enough to never let it go. The movie does that thing where it gives Patti just enough self-doubt at the beginning of the third act that she goes into this funk for a bit before realizing she loves music too much for it to ever not be a part of her life and while maybe necessary this does extend the film in ways that feel overly laborious when up until that point the pacing has been as smooth as the movie's titular character's flow. Still, it isn't the plot (you've seen this before in 8 Mile) or even the music (it's an acquired taste, but it's mostly fun) that makes the story of Patricia Dombrowski, a.k.a. Killa P, a.k.a. Patti Cake$ so endearing, but more it is the people that populate her world and come to mean to her what her alcoholic mother and absentee father never were...a support system. A family. At the center of this movie about an aspiring rapper we have a white girl, a middle-eastern guy, an elderly white woman, with the only black dude in the mix AKA the groups only hope of coming off somewhat credible based solely on appearance to the remainder of the black community-being a loner who has run away from home and shacked up in the woods to make experimental metal music. It is these people and the performances of Dhananjay as Hareesh, Moriarty as Nana, and especially Athie as a character who will not be named here so as not to ruin the surprisingly soft touch its reveal brings to the movie, but who comes to mean the most to Patti despite the two of them being the definition of polar opposites. I mean, they couldn't be more different if they tried and yet, somehow, Macdonald and Athie take Jasper's script and make it work. They form this exemplary instance where everything the film is preaching is illustrated to the point of a perfect understanding and for this, no matter if Patti ever is or not, her movie is a success.